Yesterday was my birthday. I decided I wanted to see just how much stuff I could possibly get for free on my birthday. I was amazed at the amount of coupons I was able to collect by simply signing up for email subscriptions at different restaurants. I know most people hate getting a bunch of junk email. You can always just set up a new email that is solely for this only. I simply signed up for a bunch of stuff in the matter of an hour or so about a week before my birthday. I didn’t cash in on most of the freebies because quite honestly, I was full. I was able to get my free Venti Caramel Macchiato from Starbucks, free 20 oz smoothie from Smoothie King, free strawberry shake from Del Taco, and free Filet Mignon & Shrimp from the hibachi grill at Kobe Japanese Steakhouse (plus a free cupcake at the end!). I also got a free Hand-Crafted Burger from Ruby Tuesdays. I, of course, went with the Triple Prime Bacon Cheddar Burger. I would never pay for an $11 burger but it was going to be free, so why not? Their ‘Prime” burgers are listed as being made with “…8 ounces of fresh, 100% USDA Prime beef. Less than 3% of beef is graded Prime”. The Triple Prime Bacon Cheddar Burger was served “…With aged New York cheddar and applewood smoked bacon”. When the burger came out, I have to admit, I thought it looked a little small. How they present the meal is a little odd now. I am not a big “foodie” and don’t claim to understand the restaurant business, but I thought it was a bit silly to give me a ceramic plate with my burger, to which also holds my fries in a separate ceramic dish on top of that plate and a small metal cup with ketchup. I don’t think many people would care if their fries are near the burger. I can understand the ketchup though – maybe less condiments on the table for a ‘clean’ look? In the end, it wasn’t a big deal, I just though it was silly for a burger and fries. Maybe it shows how ‘unclassy’ I am. The burger tasted amazing. The cheddar was delicious and perfectly melted on the burger. Yes, it was just bacon strips placed on the burger and not actually in the burger patty, but the bacon was cooked just right. The condiments were not overwhelming at all. And I think my boyfriend said it best when he said, ” You know it’s a good burger when you have a grease rain puddle.” It was true, the burger was very greasy and I had to be careful not to get any on my ‘Zombees’ shirt (which is one of the four shirts I always wear). Even though my first thought was “that’s small“, I was unable to finish my burger. It may have been the the free stuff we already acquired and was still sitting in my stomach – which included a shake (I don’t think I have to explain). The burger is currently in my ‘fridge and it will be lunch today. 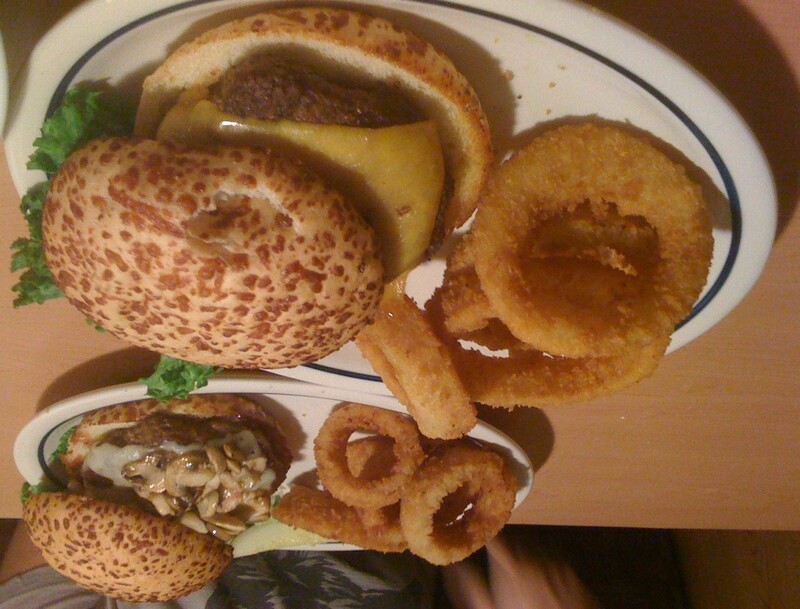 IHOP (International House of Pancakes) has a new selection on their menu right now called “Bacon ‘N Beef Burgers“. The selection includes: Cheeseburger, Bacon & Egg Cheeseburger, Bacon Cheeseburger, Mega Mushroom Burger, and Monster Burger. Ric and I decided to try some of these burgers the other night. Ric got the Cheeseburger and I got the Mega Mushroom Burger. We both got onion rings as our side. The downside to IHOP is always leaving with that “IHOP smell”. It sticks to your clothes. It’s that grease, dirty kitchen smell. 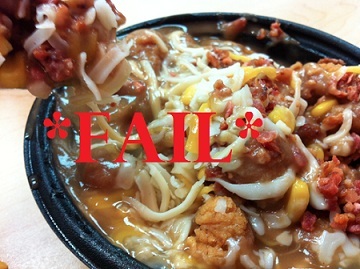 But the food is usually pretty good… depending on what you get. And you can’t deny they are better than Denny’s for that late night dinner/snack. At least that’s what I have noticed with our selection of locations. The up side is that the IHOP we go to always has the friendliest night staff. They always crack me up and they are always smiling. This may be because my boyfriend is always able to get the best out of people. The food was alright. The onion rings were kinda greasy. I would have probably enjoyed them more any other time but not as late as we went. The burger was delivered frozen to their location for them to re-cook (as the waitress told us). It tasted that way. It was still okay for a pre-made burger. They had blended the bacon into their patties. It had a smoked flavor to the burger but you could barely taste any bacon in it. Some burger selections had additional strips of bacon, but not the ones we chose. It would have been better to have the bacon strips in this case. You don’t go to IHOP with great expectations. It’s reserved for late night food… usually when you’ve been out drinking or maybe while you’re on the road. So to keep this in mind, the burgers were good. Just ‘good’.